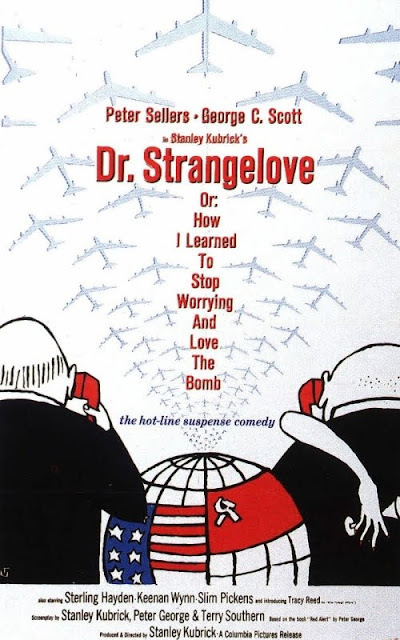 Infinite Art Tournament: The Great Movies: "Dr. Strangelove"
Previous Contact: I watched Dr. Strangelove the first time in a college auditorium, which is probably the best setting for it. I thought it was completely engrossing and hilarious. I believe the current watching is the third time I’ve seen it. Dr. Strangelove is a quirky, upbeat comedy about cold war paranoia and nuclear annihilation. It was filmed with what was obviously a minimal budget – there are perhaps five locations in the entire movie, and a model airplane flying over a surreally vague landscape – but it looks terrific throughout. Scenes alternate between suspenseful action on the airplane and comic scenes, mostly close shots of exaggeratedly expressive faces, at the air base and at the Pentagon. The suspense is suspenseful and the comedy is funny. Many, many directors have thrown exponentially more money at movies that didn’t have half the visual and visceral impact. The political satire is extremely broad, with a cast of characters that includes a grave and insane Ruskie-hatin’ Air Force general, an affably stupid Ruskie-hatin’ Air Force general, the drunk Soviet premier (who is offstage, but vividly present at the other end of a telephone), and the title character, a sinister wheelchair-bound Machiavellian with an eternal grin, a thick German accent, and a right arm that jerks periodically into uncontrollable fascist salutes. And that’s just the highbrow humor. The middlebrow humor includes (along with the ridiculously long subtitle, which we do not have space for here) obvious set-ups like a man in a phone booth trying to convince an operator to connect him to the President of the United States in order to avert global annihilation, only to find that he’s twenty cents short. Or, say, an administrative assistant translating the gruff, macho utterances of a General with whom she’s obviously just been rolling in the hay into exaggeratedly polite, professional secretary-speak. The lowbrow humor includes silly names (General Jack Ripper, Premier Kissoff, Colonel Batguano) and, in the movie’s weakest moment, a man getting sprayed in the face with cola from a vending machine that he has just shot. It is said that the original script called for a big pie fight at the end; this was filmed but, happily, edited out. So basically, it sounds terrible. And indeed, there are a lot of people who kind of hate Dr. Strangelove. But I’m not one of them. There are very few movies out there that manage to combine the better virtues of the action thriller and the screwball comedy. Hell, off the top of my head, I can only think of one: Dr. Strangelove. And for some reason, it works beautifully. Between Stanley Kubrick’s rare genius, inspired ensemble casting (George C. Scott as the irrepressible boy-man Commander of the Air Force; cowboy character actor Slim Pickens as a B-52 Commander; and Peter Sellers, for some reason, in three principal roles), a strong comic script, and a certain exuberant ridiculousness – seriously, “Colonel Batguano”? – this weird creation has a legitimate claim to be on a list of the all time great films. Plot: Concern over fluoridation leads an Air Force General to launch a massive nuclear strike on the Soviet Union. The consternation this causes the civilian leadership only intensifies when it is discovered that the Soviets have just completed work on a Doomsday Device that will, in response to this attack, end all life on Earth! Hijinx ensue. Visuals: No two ways about it, this was not a high-budget movie. But its visual impact per dollar spent on sets and effects – a tricky metric, I realize – must be among the highest ever. Dialog: Wacky and satirical and often pretty goofy. On the attack airplane, however, the dialog is often crisp and technical, a reasonable guess at what a plane full of horrified but thoroughly trained men knowing that they were part of a large-scale atomic attack might have acted like. Prognosis: Recommended for fans of Stanley Kubrick or Peter Sellers, of course. Also highly recommended for those amused by the lighter side of nuclear war, anyone who is wondering how a movie could be a screwball action thriller comedy, and anyone who always thought that Ronald Reagan was kind of a nutjob. There are some people who *still* think that fluoridation is a communist plot. When will fluoride be the element of the month? It is an element, isn't it? Hmm - guess not: "is the anion F−, the reduced form of fluorine." Oh, the movie - I haven't seen it in years but remember enjoying it very much. But then I've always been a fan of Peter Sellers. Great satirical, antiwar movie. I guess I never caught the Col. Batguano name. I didn't see it for years, because I thought it was going to be way more screwball than it was, because of the cowbow riding a missile on the marquee. But it's great. I am two years late, but this is a very fine review of one of my favorite movies. I can't recall if we saw it together in that college auditorium, which is where I first saw it. Yessir mhwitt, you were there! It was part of our larger c. 1989 Stanley Kubrick binge, in fact, which included Full Metal Jacket and Clockwork Orange.